TGx:Details for torrent "[ FreeCourseWeb ] PluralSight - Microsoft Azure Cognitive Services- Translator Text API"
Torrent details for "[ FreeCourseWeb ] PluralSight - Microsoft Azure Cognitive Services- Translator Text API"
Are you looking to quickly add the capabilities of AI-based language translation? Look no further than the powerful Azure Cognitive Services APIs. This course will show you how you can easily add them to your application.Do you have a need to add near real-time text translation to your application? 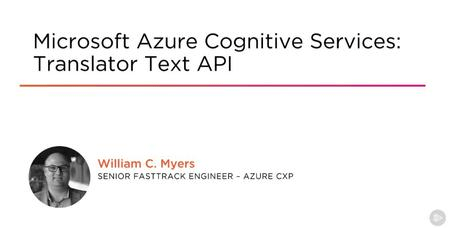 In this course, Microsoft Azure Cognitive Services: Translator Text API, you will gain the ability to easily add the Translator Text API to your own applications. First, you will learn how to configure the API in the Azure portal. Next, you will discover how to quickly test the API using RESTful tools such as Postman and Fiddler. Finally, you will explore how to create a C# application that calls the API. When you’re finished with this course, you will have the skills and knowledge needed to leverage this powerful service in your own applications.